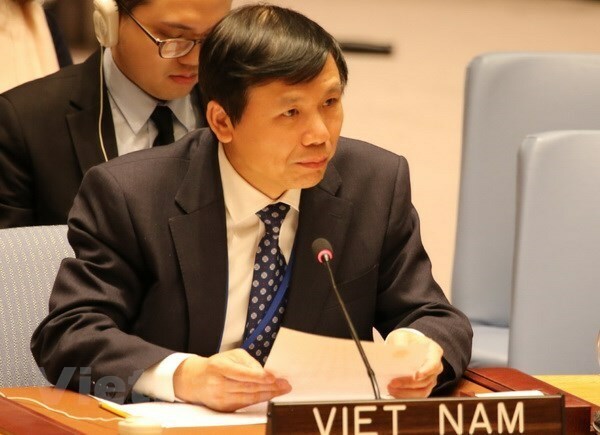 New York (VNA) – Vietnam has committed to joining international efforts in combating the financing of terrorists, Ambassador Dang Dinh Quy, Head of Vietnam’s Permanent Mission to the UN said at the UN Security Council (UNSC)’s open debate on March 28. The Vietnamese diplomat spoke highly of the debate which took place amid a spate of bloody terror attacks in recent times, with ever more complex forms of terrorist financing. He underlined the importance of implementing the obligations for countering terrorist financing as laid out in current resolutions of the council, saying the newly adopted text on preventing terrorism financing serves as a crucial gap filler and a timely response to remaining challenges. He called on countries to enhance action coordination and information exchange, and support one another to improve anti-terrorism capacity. He also stressed the role of the banking sector and competent parties in identifying dubious transactions, revealing terrorist financing, sharing Vietnam’s experience in completing legal frameworks in line with the UNSC’s resolutions. He noted that Vietnam has become a member of various bilateral and multilateral treaties on terrorism prevention, and was strongly committed to carrying out recommendations by the UNSC’s Financial Action Taks Force and ASEAN’s initiative on anti-terrorism and extreme violence. At the event, Vladimir Voronkov, Under-Secretary-General of the UN Office of Counter-Terrorism, said the resolution is a comprehensive and multidimensional approach to keep national and international financial systems and institutions properly safeguarded from being abused by terrorists. He also called on member states to make national experts available to UN programmes on countering terrorist financing, alongside significant financial support to build capacity.